Do you still remember your thought in the last Ramadhan? which that you think perhaps it might be our last Ramadhan and hope that we will be given a chance to meet next Ramadhan. Yeah, It's coming again friend. It's coming~~~~!! My feeling deep in my heart really dedicate all the gratitude to Allah for this opportunity to meet Ramadhan again in this year 2010.. It can be understood that the Quran was revealed in the month of Ramadhan either gradually or directly to the Prophet Muhammad. Jibril also revise the recitation of the whole al-Quran in this month with the Prophet, in order to strengthen his memorization, once in a month, and twice for the last Ramadhan before his death. There were a lot of historical moment happened in Ramadhan including Ghazwah Badr, Isra' Mi'raj and so on. Actually I have to teach all these information for my students in the subject of 'Science of Quran'. 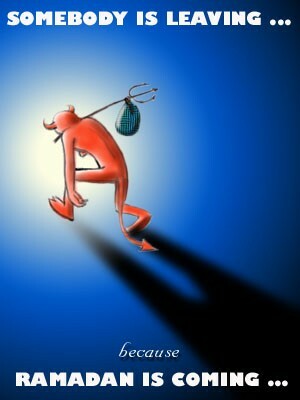 The Prophet said that: “And it (Ramadhan) is the month of Sabr (Patience). And Sabr, its reward is Jannah (Paradise)”. The meaning of this portion of the Hadith is that the month of Ramadhan is a month in which extreme patience is required. It is a month in which the patience of a man will be tested time and again, for the change of lifestyle always reduces a man’s level of patience and thus making him more impatient than he would be in other months. Similarly, the month of Ramadhan is a month of worship and prayer, we have the extra night prayer of Taraweeh in the month of Ramadhan and we are encouraged to perform Qiyamullail every night. This is the month that we can increase our Ibadah to the only God. It cannot be denied that the blessed month of Ramadhan will indeed encourage a person to worship Allah Ta’ala in greater amounts than in the other months, but it should be also noted that we have to Istiqamah in each of every actions in another months, not only for Ramadhan..
All of this entry is reminder to myself, then it is a sharing to all my friends.. May Allah make out efforts for this coming month of Ramadhan successful and may He grant us the rewards that He has promised His pious servants. Ameen..
**What if this coming Ramadhan is my last Ramadhan?? The first day of Ramadhan in this year will be on 11 August 2010, insyaAllah..